湖泊科学 2016, Vol. 28 Issue (1): 59-67. DOI: 10.18307/2016.0107. 童亚莉, 梁涛, 王凌青, 田舒菡, 双向环形水槽模拟变化水位和流速下洞庭湖沉积物氮释放特征. 湖泊科学, 2016, 28(1): 59-67. DOI: 10.18307/2016.0107. TONG Yali, LIANG Tao, WANG Lingqing, TIAN Shuhan. 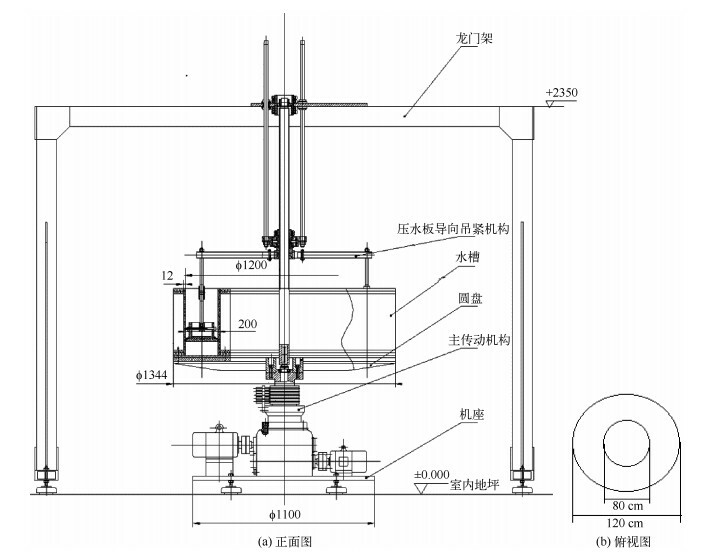 Characteristics of nitrogen release from Lake Dongting sediments under variable water level and velocity in the two-way annular flume. Journal of Lake Sciences, 2016, 28(1): 59-67. DOI: 10.18307/2016.0107. 摘要：浅水湖泊生态系统中的沉积物-水界面是湖泊内源氮释放的重要界面, 而水动力因素是改变沉积物氮释放的重要因素.三峡大坝修建以后, 长江中下游通江湖泊的水动力条件发生了明显的变化.通过采集洞庭湖湖口区域的沉积物和水样, 在双向环形水槽动力模拟装置内模拟湖泊水位和流速的变化, 探讨湖泊沉积物氮在沉积物和水系统中的二次释放特征.结果表明, 随着扰动强度的增加, 上覆水悬浮物浓度增大, 上覆水中总氮浓度增加, 沉积物向上覆水释放氮的强度增强, 水动力条件的改变所引起的沉积物内源氮释放不容忽视.在该模拟实验条件下, 沉积物存在最适扰动水位(20cm), 此水位下上覆水中悬浮物浓度最低, 总氮浓度最小.水动力条件的改变对上覆水和沉积物-水界面处铵态氮和硝态氮浓度的影响并不明显, 孔隙水中铵态氮与硝态氮之间发生形态的转化. Abstract: Sediment-water interface is a crucial place for internal nitrogen release in the shallow lake ecosystem and the hydrodynamic factors have significant influence on sediment nitrogen release. After the construction of the Three Gorges Dam, hydrodynamic conditions for shallow lakes in the middle and lower reaches of the Yangtze River have changed apparently. 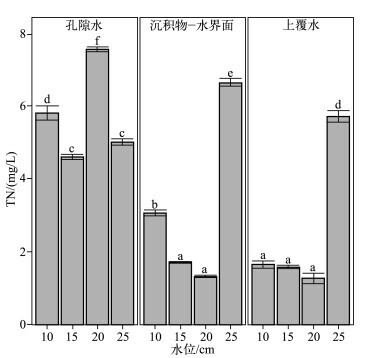 Water and sediments samples collected from Lake Dongting region were used to simulate the release characteristics of nitrogen from sediments under experience conditions of variable water level and velocity. The results showed that as the water level/velocity increased, concentrations of the suspended solids (SS) and total nitrogen (TN) in the overlying water increased and the nitrogen release intensity from sediments to overlying water enhanced. This internal nitrogen release caused by variable hydrodynamic conditions should not be ignored. Under the simulation conditions there was an optimal disturbance water level of 20 cm, where concentrations of the SS and TN were lowest in the water level nearby. The influence of variable water level and velocity on ammonium nitrogen and nitrate nitrogen in the overlying water and sediment-water interface were unapparent, while there was a form transformed between ammonium nitrogen and nitrate nitrogen in the pore water. 曲丽梅, 姚德, 丛丕福. 辽东湾氮磷营养盐变化特征及潜在性富营养评价. 环境科学, 2006, 27(2): 263-267. 金相灿, 尚榆民, 徐南妮. 湖泊富营养化控制与管理技术. 北京: 化学工业出版社, 2001, 87-89. 肖化云, 刘丛强. 湖泊外源氮输入与内源氮释放辨析. 中国科学:D辑:地球科学, 2003, 33(6): 576-582. 李大鹏, 王晶, 黄勇. 反复扰动下磷在沉积物和悬浮物以及上覆水间的交换. 环境科学, 2013, 34(6): 2191-2197. 罗潋葱, 秦伯强, 朱广伟. 太湖底泥蓄积量和可悬浮量的计算. 海洋与湖沼, 2004, 35(6): 491-496. Zhang YK, Yang LB, Lei K et al. Exchange and deposition fluxes of nitrogen and phosphorus across sediment-water interface in lower Yellow River. Journal of Sediment Research, 2013, 6: 66-74. Wu CD, Wang Y, Han JG et al. Preliminary study on nitrogen and phosphorus release characteristics from sediment in Beigu Wetland. Enuivonmental Science and Technology, 2008, 31(4): 10-12. 秦伯强, 范成新. 大型浅水湖泊内源营养盐释放的概念性模式探讨. 中国环境科学, 2002, 22(2): 150-153. Jiang YS, Li XC, Xing YH et al. 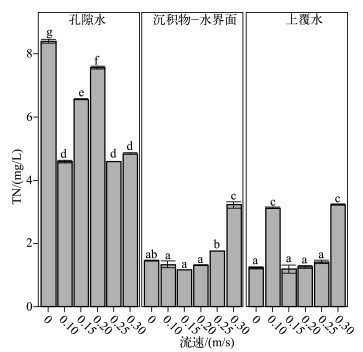 Impacts of disturbance on release of total nitrogen and total phosphorus from surficial sediments of Dongping Lake. Environmental Science and Technology, 2010, 33(8): 41-44. 孙小静, 秦伯强, 朱广伟等. 持续水动力作用下湖泊底泥胶体态氮、磷的释放. 环境科学, 2007, 28(6): 1223-1229. 朱广伟, 秦伯强, 张路等. 太湖底泥悬浮中营养盐释放的波浪水槽试验. 湖泊科学, 2005, 17(1): 61-68. 孙小静, 秦伯强, 朱广伟等. 风浪对太湖水体中胶体态营养盐和浮游植物的影响. 环境科学, 2007, 28(3): 506-511. 逄勇, 颜润润, 余钟波等. 风浪作用下的底泥悬浮沉降及内源释放量研究. 环境科学, 2008, 29(9): 2456-2464. 孙小静, 朱广伟, 罗潋葱等. 浅水湖泊沉积物磷释放的波浪水槽试验研究. 中国科学:D辑:地球科学, 2005, 35(增刊Ⅱ): 81-89. Sønderdaard M, Jensen JP, Jeppesen E. Role of sediment and internal loading of phosphorus in shallow lakes. Hydrobiologia, 2003, 506(1): 135-145. 窦国仁. 再论泥沙起动流速泥沙研究. 泥沙研究, 1999(6): 1-91. 王政, 赵林, 李鑫等. 不同时间尺度下湖泊氮素内源释放强度影响因素的研究. 农业环境科学学报, 2011, 30(12): 2542-2547. 何宗健, 吴志强, 倪兆奎等. 江湖关系变化对鄱阳湖沉积物氨氮释放风险的影响. 中国环境科学, 2014, 34(5): 1277-1284. 刘婉清, 倪兆奎, 吴志强等. 江湖关系变化对鄱阳湖沉积物重金属分布及生态风险影响. 环境科学, 2014, 35(5): 1750-1758. 赵海超, 王圣瑞, 焦立新等. 洱海沉积物中不同形态氮的时空分布特征. 环境科学研究, 2013, 26(3): 235-242. Reddy KR, Fisher MM, Ivanoff D. Resuspension and diffusive flux of nitrogen and phosphorus in a hypereutrophic lake. Journal of Environmental Quality, 1996, 25: 363-371.